Super Eagles coach Stephen Keshi says a place in the quarter-final should take precedence over his record as the first African to lead an African team to the second round at the FIFA World Cup. Last year he became the first black African coach to have won the Africa Cup of Nations in 21 years, and last Wednesday he helped Nigeria secure a place in the round of 16 at Brazil 2014. The former Nigeria captain said. “For me, my team and country come before any personal glory. There have been suggestions in some quarters that Keshi's achievement in winning the Nations Cup and taking his team to the knock-out stages has not been given the value it should by the international media. “What is important is to focus on what lies ahead – not Stephen Keshi and his record,” Keshi said. Nigeria will face France for only the second time at senior level on Monday in Brasilia. In their previous clash, the Super Eagles beat France 1-0 in a friendly in Saint Etienne in June 2009, but Keshi says it will be a different ball game against the French as Nigeria aim to equal Africa's all time best. Cameroon, Senegal and Ghana have all reached the quarterfinals in 1990, 2002 and 2010 respectively. 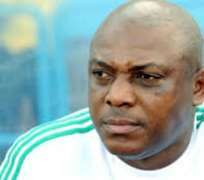 “We are not bothered about the past but only interested in this present day,” Keshi added. “My boys know what I expect and our opponents will not make life easy for them. “The Super Eagles have never made it to the quarterfinals so they can make history of their own. Keshi is one of only two men who has won the Nations Cup as a player and a coach – the other being Egypt's Mahmoud El-Gohary. In 1994 Keshi captained the Super Eagles to their second continental success in Tunisia and 19 years later he was in charge of the side as they won the trophy for the third time in their history in South Africa.